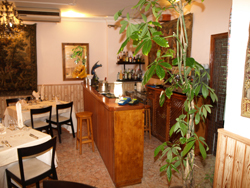 On June the 4th 2008, Maxims Restaurant re-opened in a brand new location – Cuevo del Polvo, the former home of El Guanche, on the main road between Alacala and Los Gigantes, just above El Varadero. 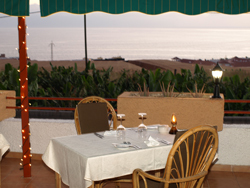 The new setting offers, easy parking and spectacular sea views from the cliffs of Los Gigantes to El Varadero, The terrace is the perfect setting to enjoy a delicious meal while watch the sun setting over La Gomera. 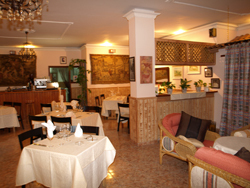 In the cooler months you can dine in the very tastefully decorated interior. The owner, Denis Kets, is from Belgium. After loosing his job 9 years ago in his home country he looked for a brand new start. Denis and his son packed up their belongings and moved to Tenerife, attracted by the weather and the lifestyle. His new life started in Las Galletas working in an apart/hotel whilst his son enjoyed his new school and the challenge of learning another language, then in Dec 2006 he opened Maxims in Los Gigantes. There he met Christina. Christina, (left) having worked in the Swiss Chalet, Ireland for many years where she won the Irish Tourism Award in both 1984 and 1985 moved to Tenerife in 1986, eventually becoming the owner/chef of La Bodega in Puerto Santiago for 10 years. Due to family commitments she retired. 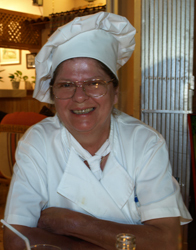 Fed up and bored with retirement she became, and still is, chef of Maxims, preparing and cooking a mouth watering selection of French and Belgium cuisine with that little twist of luxury that can make an evening really special. All produce is prepared specifically to your order using only the highest quality fresh products. Every Friday and Saturday evening, as well as Sunday lunchtime, you can dine at your leisure and enjoy listening to their resident pianist – Julia – playing a selection of much loved tunes gently in the background.